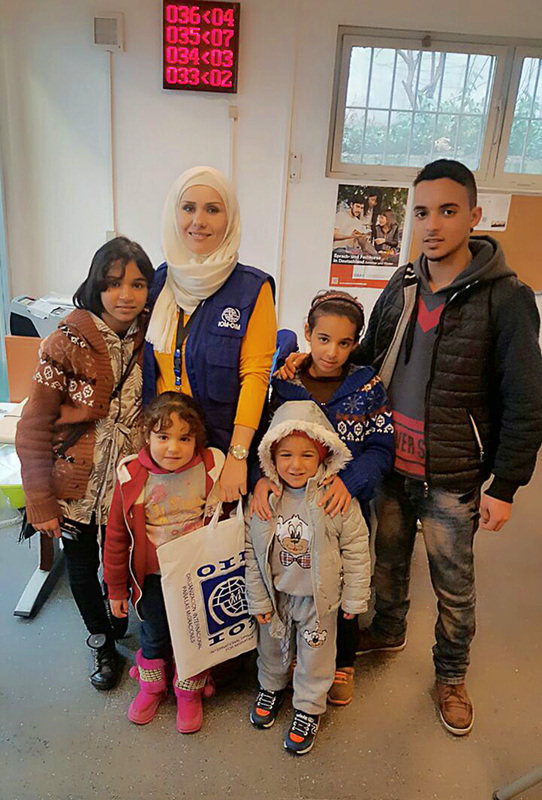 Iraq - Since July 2016, IOM, the UN Migration Agency, has assisted in person over 50,000 vulnerable migrants with family reunifications in Germany through its Family Assistance Programme (FAP). The aim of FAP, which was initiated and funded by the German Federal Foreign Office, is to support family reunification applicants in Iraq, Turkey and Lebanon during the visa application process for Germany. At their offices, IOM helps them to correctly complete the forms and prepare their documents in order to reunite with close family members already granted asylum in Germany. The FAP project also works to dissuade refugee families from seeking unsafe, irregular migration channels; to support German consular staff; and to help refugees integrate into German society successfully. Over half a million Syrians and Iraqis have registered for asylum in Germany since 2015 and approximately 355,000 have been granted refugee status, according to the German Federal Office for Migration and Refugees (BAMF). Most of them have arrived taking a perilous boat journey and left behind their family members. As per German laws, those granted refugee status qualify for family reunification. Eighteen-year-old Abdulrahman and his younger siblings were five of those supported through FAP. In 2015, Abdulraham’s father, Nasser, was one of the million migrants and refugees who crossed into Europe in search of a safe life for his family. Knowing the risks of the journey, Nasser made the difficult decision to travel ahead of his children. Alone in Turkey, young Abdulraham acted as a father-figure to his younger siblings, living in a one bedroom apartment off money sent back by their father. After Nasser was granted refugee status in Germany, IOM’s FAP programme expedited the process to reunite the children with their parent. The family reunification process starts with an online appointment to a FAP centre, where IOM staff ensures the completeness of their documents while assisting them in preparing their application. In Lebanon and Turkey, IOM also supports the Consulates by collecting visa applications on their behalf. For parents waiting with young children, a playroom, with toys, books and colouring pencil sets, provides them with some entertainment. Children are also taught basic German language skills, to prepare them for their new lives before travel. In addition to the 50,000 cases processed by IOM’s FAP office in Lebanon, Turkey and Erbil, the three offices have also provided remote assistance to an estimated 162,000 Syrian and Iraqis at an average of 1,400 per month. The Family Assistance Programme is part of IOM’s facilitated migration portfolio through which IOM provides tailored operational assistance to states through efficient, cost-effective and non-profit international migration services. Already in Germany, Mehdi Khalil and his cousin Lazem, are both four months away from their 18th birthday. To ensure reunification with their family members IOM has fast tracked their applications to allow them to get a visa before that date. The fathers of the young boys – Abbas, 37, and his brother Azdaeen, 43 – together with the nine other children across their two families, cannot wait to join their sons – and to start a new life. Both men paid for their eldest boys Mehdi and Lazem, 16 at the time, to be smuggled into Germany. It cost them a total of USD 10,000, a combination of money they said they borrowed from extended family members and their life’s savings. The Yezidi brothers, farmers from Iraq’s Sinjar province, lived a comfortable life. They reared cows and sheep, from which they produced milk and made fresh cheese and yoghurt. They also grew crops and vegetables. Though not rich, the family needed little and enjoyed the tranquillity of their life and community; that is, until ISIL took over their area, killing thousands of men and forcing tens of thousands to flee. They also took nearly 6,000 women and children as slaves and hostages. The brothers and their children were lucky enough to escape to the Sinjar Mountains, where they spent a week with very little food and water before being rescued. Since then they have been internally displaced and living in Bajet Kandela camp in Kurdistan’s Dohuk Governorate. “We can’t wait to get there and be reunited with our boys,” Abbas said. “Here we have nothing left, whereas in Germany we have the prospect of a new life and a fresh start for our children,” he added. “We had a comfortable life here, then Daesh came and destroyed our homes, all three of them, as well as our farms. We lost everything… and our community was dispersed… They even stripped us of our memories,” Abbas continued, reminiscing on the past. Mehdi’s mother, Khanso, cries at the mention of her son. “I miss him very much. He liked to stand in front of the mirror to style his hair after a shower,” she recalled. “Remembering that hurts,” she recalled. “I miss his hugs and kisses and just want to see him again, to take him in my arms and kiss his eyes,” Khanso said sobbing slowly. But both the boys’ mothers say, their eventual reunification will also come with some pain because of those they will have to leave behind – elder married daughters and grandchildren. Perhaps hardest of all is the fact that they may initially have to leave some of the younger children behind. The reunification process for minors initially only allows for them to be joined by their parents, unless there are exceptional circumstances that mean the extended family should also go in the first phase. Once the parents themselves have been granted refugee status, which provides them with a residency permit, they are able to apply to be reunited with the other children. “Our joy will be bittersweet,” said Ghazala, Lazem’s mother who will leave behind two married daughters and sons, her two grandchildren as well as some of her younger children.